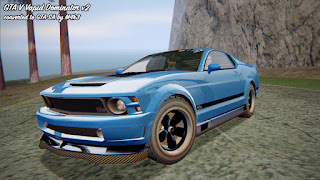 GTA 5 Vapid Dominator v2 converted and edited to GTA San Andreas by M4k3. Original model and textures: Rockstar Games. It's the 2nd version of the Dominator. 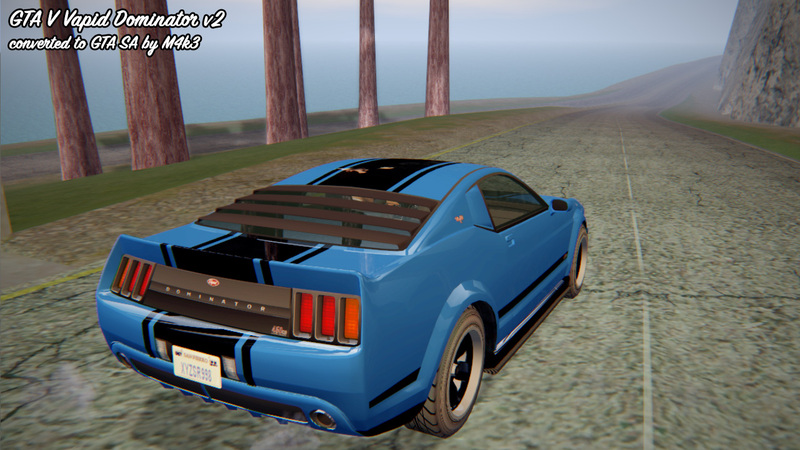 Some of the changes are: new interior, tuning parts can be added via paintjobs now and various tweaks and fixes. 3 versions are included: ImVehFt version(requires ImVehFt installed), SA lights and SA styled version. Custom collision and flat shadow. 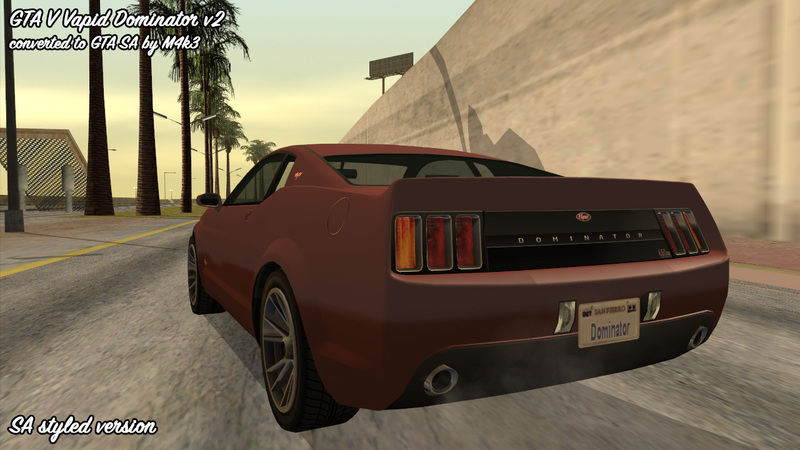 GTA SA styled numberplates, custom numberplates can be installed via paintjobs. Tunable in TransFender + custom tuning can be added via paintjobs. Supports paintjobs with alpha channel (transparency). 3 paintjobs and a template are included. 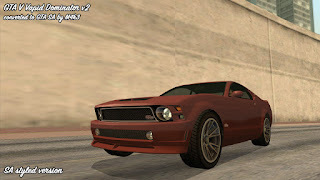 Works in SAMP (no sinking wheels, doesn't crash in tuning etc) if replaced by default. 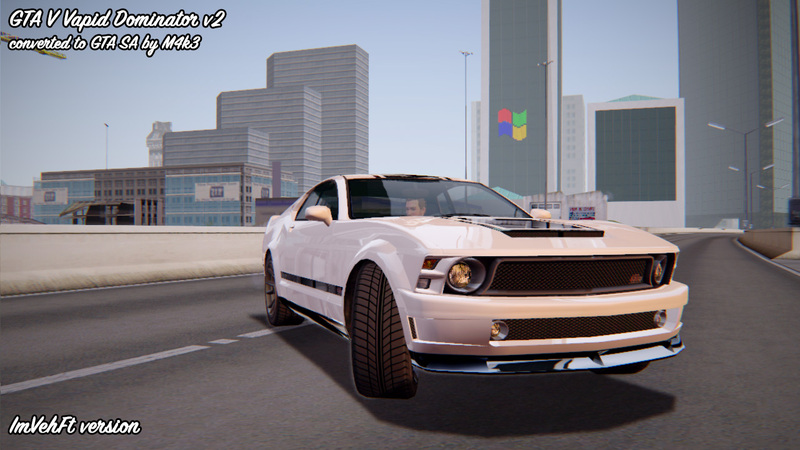 Supports Vehicle Special Abilities (working suspensions). Realistic material settings (interior, plastic parts are not very shiny but chrome, metal parts of the vehicle are more shiny and have reflections). Requires ImVehFt 2.1.1 (fully working lights, working steering wheel, brake hubs, custom colours, GTA IV styled dirt on recolorable body and chrome parts). 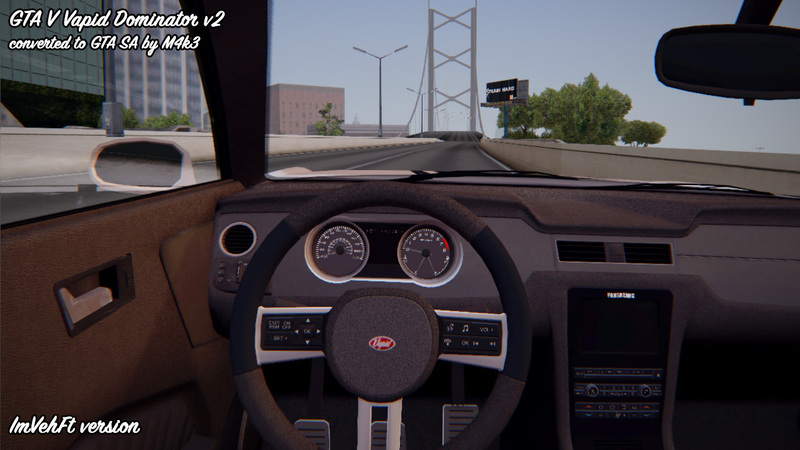 Supports Active Dashboard 3.2.1 mod(speedometer, tachometer, fuel and temperature gauges, window wipers). 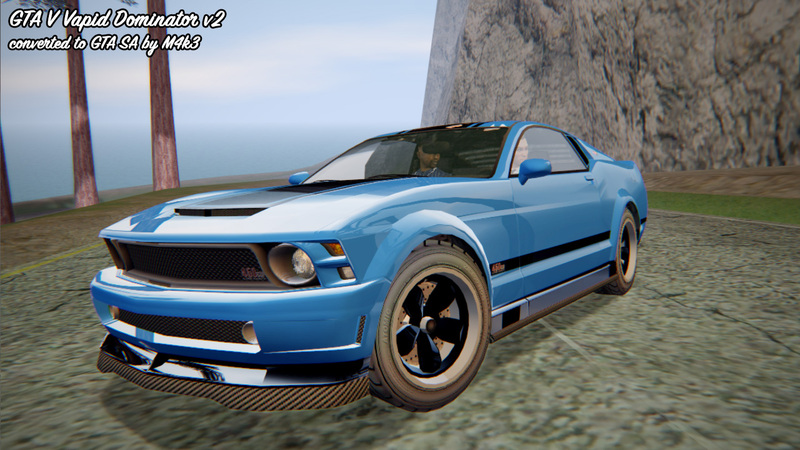 4 car colors support (primary - body paint, secondary - body paint, tertiary - wheels, quaternary - windows tint). Supports (does not require) ImVehFt. Low DFF and TXD sizes. 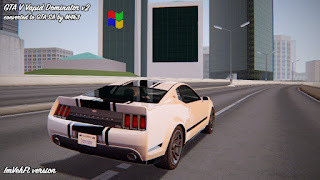 GTA SA styled scratches, lights.